> List Sotheby's International Realty, Singapore > Eight Prime Districts Instead of Three? 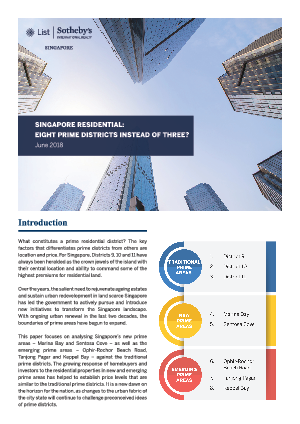 This paper focuses on analyzing Singapore's new prime areas - Marina Bay and Sentosa Cove - as well as the emerging prime areas - Ophir-Rocher Beach Road Tanjong Pagar and Keppel Bay - against the traditional prime districts. The growing response of homebuyers and investors to the residential properties in new and emerging prime areas has helped to establish price levels that are similar to the traditional prime districts. It is a new dawn of the horizon for the nation, as changes to the urban fabric of the city state will continue to challenge preconceived idea of prime districts.